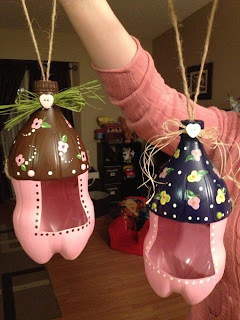 These Pop Bottle Bird Feeders are super cute and super fun to make! The color possibilities are endless and it was such fun to see what the ladies came up. The finished pictures above were our demos that we made up to promote the craft at church. 1. Using your scissors cut away the middle section of the pop bottle. See picture below for the approximate amount to cut away. It does not have to be exact, if you want a shorter feeder than cut more out and if you want a taller feeder than cut less out. 2. Drill a small hole through the middle of the bottle cap. The hole needs to be big enough for the twine to fit through, but not too big because you need to know the twine and not have it pull through the hole. 3. In the bottom section of the bottle, cut an opening as big or as small as you'd like for the door of the feeder. Using your foam brush, paint the bottom part of the feeder. The amount of layers you need to paint on will depend on the color you choose. The pink we chose only needed two layers, but the blue needed four layers to cover the streaks. Make sure to let each layer completely dry before adding another layer. Next paint the top part of the bottle...don't forget to paint the bottle cap! 4. Once the paint for the bottom of the bottle is completely dry, take your hole punch a punch a hole at the top of the bottle bottom, about 2" in on each side of the door opening (see picture below). Now take the top part of your bird feeder and place it on the bottom. Mark a spot on the top of the feeder so that you can punch it with the hole punch. Make sure you mark it properly so that it lines up with the holes you punched in the bottom of the feeder. 5. Take your twine (roughly a 3' long piece) and thread one end into the inside of the bottom section of the pop bottle and tie in a double knot. With the same end of your twine, "stitch" it through the top section of the pop bottle. Run your twine through the top and stitch the other side together and fasten it with a double knot. Now take your twine and push it through the top of the bird feeder, through the bottle cap. The long loop that is sticking out is your hanger. This was incredibly hard to explain, I hope the pictures below better explain it! 6. Take your hole punch tool and punch holes on each side of the door opening and at the back of the feeder. Thread your brads through and spread them apart to tighten them up. These are an extra way to reinforce the feeder and nice a decorative touch depending on the type of brad you use. The brads we used were about a 1/4" circles. 7. Once the brads are in place and you have finished adding all your decorative paint touches, take it outside and give it three good coats of spray with your can of waterproof sealer. This spray is pretty potent, so definitely do this part outdoors. 8. Now you can add your raffia and any embellishments you wish to add. 9. Fill it with birdseed and hang it outside for the birds to enjoy! Side Note: After we completed these we thought that next time we made them, we would add a wooden dowel through it (just drill a hole the size of the dowel you choose under the door and through the back). The dowel would make a great perch for the birdies!! It's beautiful! Thanks for idea! How did these hold up in the outdoors? Did the paint chip off? So far they have held up really well! I have had mine hanging for over a year and a half in two freezing cold winters. Just make sure you seal it well with an waterproof spray sealer. You can use suitable width plastic tubing cut down the length and fitted over the cut edge. Colored duct tape on cut edge would work too. Just my thought I had. Thanks Theresa! Did you get a chance to make one? How did it turn out for you? I've made bird feeders out of recycled bottles before, but I love the way you made this one. Pinned and would love for you to share this on Merry Mondays linky party tomorrow. Lovely bird feeders ! I made these but didn't colour them. But please take care of the sharp edges which may injure the birds . Either press the edges by hand or press them with a hot iron. This is a great way to repurpose soda bottle. These are so cute! Keeps the bottles out of the landfills and useful for feeding the birds. My daughter and I made one of these today! Thank you for the post! Thanks for such a beautiful bird feeder idea! Please keep posting new creative ideas. cool bird feeders!! and easy to make too! Instead of trying to feed a string through a hole, there are eye bolts that you can buy at most hardware stores. I have seen these things from 1/16 inch thick, all the way up to 1/2 inch thick. as far as I know, they come in solid brass, brass plated, & galvanized steel. personally, I prefer the brass. it will last longer than the galvanized steel or the brass plated. The information which you have provided is very good. It is very useful who is looking for Flip Top Cap Manufacturer India. I put a couple of small holes in the bottom of the bottle just in case water or snow melt enters it will drain and save the food. adorable!!! at first I thought they were fairy houses, mine would fit perfect!! Great idea, thanks!!! I'm making these with my preschoolers! We are using water bottles instead of soda bottles. Great idea, thank you! What is the dry time for these? For each layer and total time spent on drying paint? I want to use this idea for a program at my Public Library, but have concerns about getting the project done in the allotted time. There are two holes punched on each side in the photo where you are threading the twine, are one set of the holes a mustake if not i got liost in the directions on those. Great post!! nice to see!! BEST FRIENDS AND A CRAFTY IDEA! A Sneak Peak of More Tutorials Coming Soon!